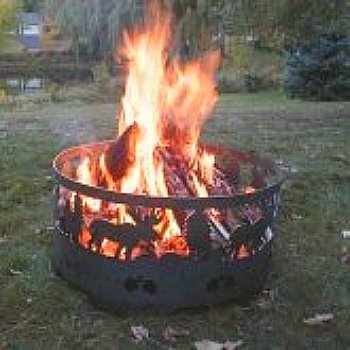 Fire rings are essentially the same thing as fire pits, except that they have no legs and no bottom. They are made to be placed directly on the ground. The fire is then built directly on the ground, inside the ring. Thus the fire is contained and is kept from spreading around the area. A contained fire is easier to maintain, in addition to being safer. 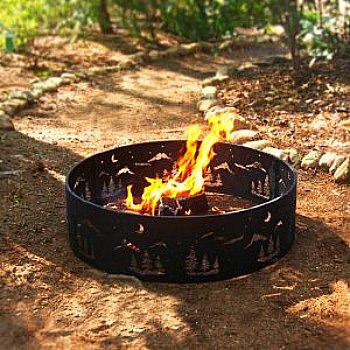 Models are available in many of the same decorative patterns as their cousin, the fire pit. They are typically made of cast iron since they need to be sturdy and durable in order to hold up well on the ground. I wouldn't recommend a copper model, even if you could find one. Some models are designed to be truly portable and can be carried along on camping trips, or moved to other locations quite easily. Some have a detachable cooking grid as an option. There are even some that burn natural gas or propane. To me, since this is a very basic fire containment apparatus, the only fuel that makes sense is wood! Even though this is a very basic, low tech option - great care should still be used while enjoying it. Fire should always be used cautiously. Keep your firewood completely contained inside the ring. Don't use wood too big to be contained entirely. Pay attention to the location you choose for your fire. Keep it away from structures or vegetation that could serve as fuel. Be aware of tree branches overhead. The intense heat from an open fire can easily scorch leaves off of a tree, and in some cases could catch the tree on fire. Never leave any fire, in any system, unattended and be sure to keep children at a safe distance. Fires are wonderful and wondrous, but if not respected can become dangerous, even deadly.